So what do vegans eat during the holidays??? Um, food? How is that even a question? But alas it is the first question I get wen talking to people about holiday get togethers. As a self proclaimed “foodie” and a vegan, the holidays are the perfect excuse to test recipes on normally unwilling subjects( who will know that one certain pie has tofu instead of eggs in it, as it sits amongst all of those other pretty desserts??) This year I tried a few recipes I had found and a few of my own but here’s a rundown of my holiday spread, along with a brief commentary if each. Cinnamon Soaked Wheatberry Salad from Vegetarian Times Magazine- eh it was ok but I’d trade the cilantro for parsley next time and lessen the maple syrup in the dressing, after the apricots soaked it up it was way too sweet. Mediterranean stuffing with figs and hazelnuts- tooooooo many nuts, it was super rich with the port wine soaked fruit. I’d adjust a lot of components next time. I also had to bake it until it was black to get it not soggy. Fresh Greenbean Casserole with vegan cream of mushroom soup- the soup is my original recipe which was made better by some added oyster mushrooms thus time around. The fresh green beans were amazing ad I will definitely be making this again. Recipe for the soup will be in a later post. 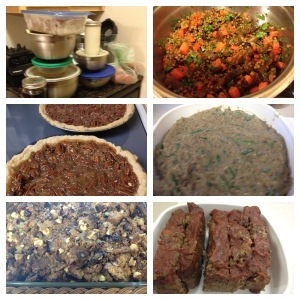 Lentil Walnut Loaf- from Oh She Glows I love this recipe. It i made two loaves originally and had already eaten one through the course of a couple weeks so I was just tired of it by the time thanksgiving rolled around. Great recipe, I used an old fashion hamball sauce on it instead of the given one. Maple Pecan Pie from Post Punk Kitchen I will forever shout my adoration for this blog, books and anything from Isa and/or Terry. The only thing I’ve never been thrilled with are the brownie recipes but that’s another topic for another time. BUT hands down my go-to for anything deliciously vegan. The pecan pie did not disappoint. I think I’ll use less pecans next time so there aren’t as many “wet nuts”(aka liquid soaked and not caramelized like I like) and more of the custardy center. It satisfied the two old school- mama made them right- no funny weird stuff on my plate type men at our get together. I call that a win. AND to top it all off here’s a picture of the goods. Not the best dinner spread I’ve made but no one went hungry.